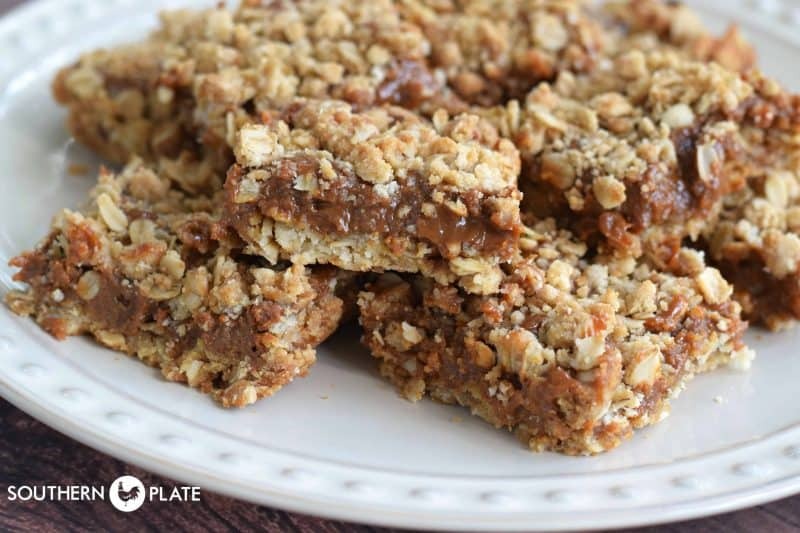 These Quick & Easy Oatmeal Caramelitas are a caramel lovers dream! I’m a caramel gal. I cast caramel the same longing looks that most folks reserve for chocolate. Creamy, gooey, caramel has always called my name louder than any other form of candy. Even when I was a little girl, I’d hunt for pennies around the house so I could go to the store around the corner and trade them for penny caramels. I’d clutch that little brown paper sack and ride my bicycle home, racing the wind as if someone knew what treasure I held, and go straight to my room to hide them underneath the blue jeans my brother had handed down to me. Once safely in my pants drawer, I’d slip away a few times a week and have a single caramel, sitting down in my bedroom floor with a book while I enjoyed it. I rationed those puppies out as if they might be the last caramels ever made :). So as a caramel lover, when I tell you that today’s recipe is something special, you need to know that I am sharing one of my treasures with you. 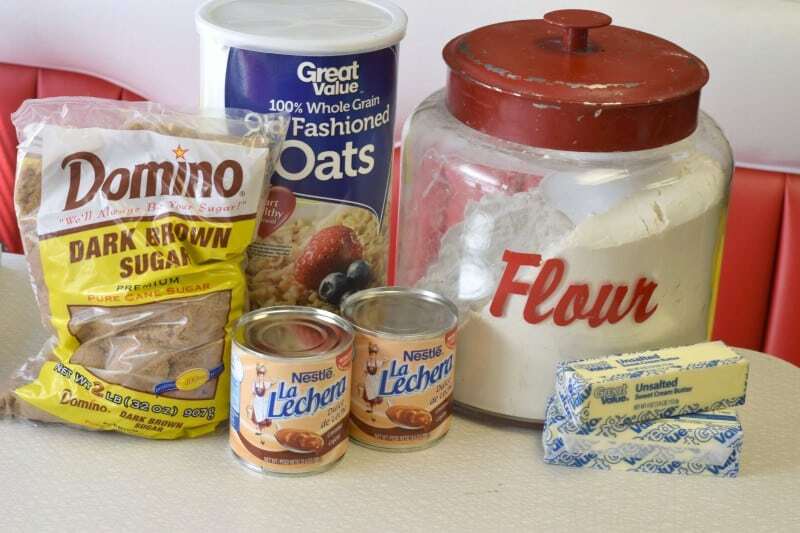 The ingredients in this are pretty easy and you probably have most everything you need except for the caramel: Brown Sugar (I prefer dark), Old Fashioned Oats (quick will work), Self Rising Flour, Butter, and two cans of caramel*. *I used to could only find this caramel on the Mexican foods aisle but it is getting pretty mainstream now and you can often find it on the baking aisle, too. It is pretty much heaven in canned form. 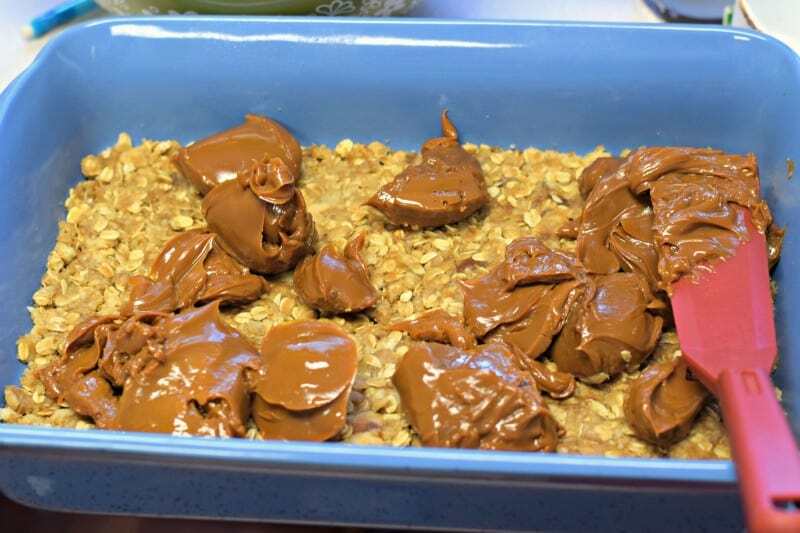 Place everything but the caramel in a large mixing bowl. Now get a pinch of it to taste because it is WONDERFUL! Pat half of this mixture into the bottom of a greased 9×13 pan. Take your two cans of caramel and BLOP caramel all over the top. Then spread it out to cover. Sprinkle the rest of your mixture over the top. Bake this at 350 for 30 minutes or until lightly browned. Allow to cool pretty good before cutting it so the caramel has time to set up again. I know, this just sounds so wrong and normally I would quietly encourage you to eat one warm but trust me, that caramel is hot as tar straight out of the oven and although it is worth a tongue burn, that would inhibit your ability to enjoy then later so I’m thinking of your safety here. Did you see how easy that was? Seriously! It is amazing that a bar with this much deliciousness can be done with so little effort. 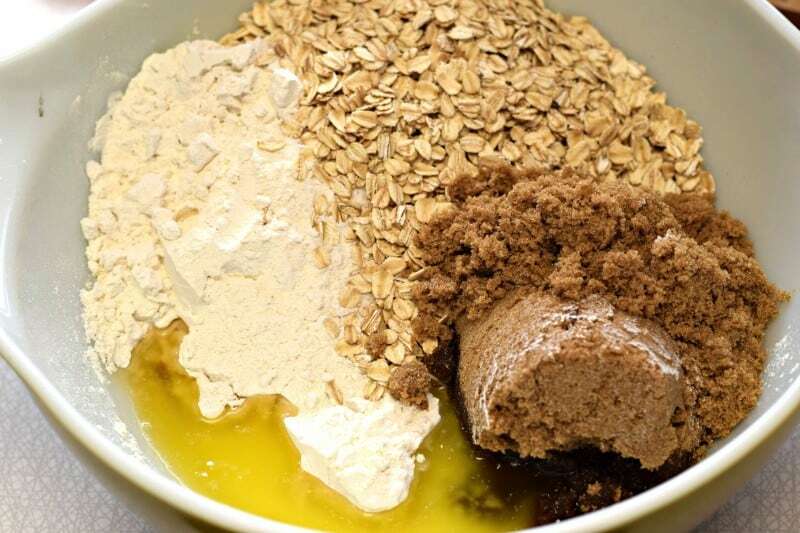 In large bowl, stir together first four ingredients until well blended. Pat half of mixture into bottom of greased 9x13 pan. Dollop all of caramel over top of the mixture and then spread until evenly covered. 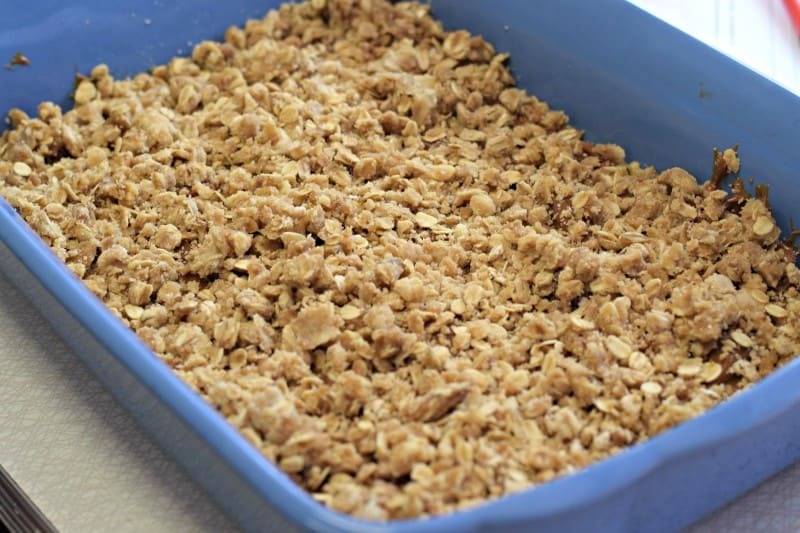 Sprinkle this with remaining crumb mixture. Bake at 350 for 30 minutes, or until lightly browned. Allow to cool at least slightly before serving so caramel will be set again. 🙂 Thank you Judy!!! I hope you enjoy the caramelitas!! My red-headed, country-girl 11 yr old daughter will love these! I was looking for something besides brownies or chocolate chip cookies to make this weekend for the kids, this is going to be it. Give her a big hug for me and I hope they enjoy the caramelitas!! When my daddy would go to GEX store when I was a little girl-kinda like an early Target or Wal-Mart, I always loved when I got to go with him. On the way out of the store they had the candy counter and my treat was either a bag of caramel corn or Brach’s caramel squares. I did not get them each time because money was so tight, but when I did, you would have thought I was given the world-on man Christy-thanks for sharing. I have a get together this weekend and wanted something sweet to take-this will be it. I hope you have a wonderful time at your get-together this weekend Kathi!! Enjoy the caramelitas!! Love carmel, bought the square KRAFT carmels when I could, they were 2 cents apiece and I could get other candies 3 for a penny so buying carmels meant less of them. I also loved MacIntosh taffy which were hard and came in a box, which got dropped on a big rock to break it into small chunks. Don’t think I can get the canned stuff here, but hey can make my own, will try this if I have time this weekend. I hope you enjoy them Eva!! Where does one train to be a professional alpaca groomer? LOL! For an alpaca groomer, you certainly have the very best recipes!!! I really appreciate this one right now since I am making cookies for dessert for my step-son’s wedding rehearsal dinner…need to feed 50 people and making lots of different kinds of cookies should make everyone happy!! This will definitely be one of the cookies shared that night!! 🙂 I hope everyone enjoys the Caramelias and I just know the wedding with be gorgeous!! Oh my stars!!!!! Those look yummy in the tummy!!!!!! I hope you get the chance to make them soon Stephannie!! You are the angel to share a treasured memory down memory lane and a favorite recipe. Thanks for the good cheer and the fun I will have making this with my little granddaughter. She will love sprinkling and spreading. Her daddy will have a treat to enjoy after a hard day’s work. Be blessed and thanks again! Do you think thinly sliced apples would work on top of carmel, under oats? It sounds good, but I didn’t know if the apples would give off too much juice. I think it would work Rhonda, you could also consider using dried apples. How about a top sprinkling of chopped pecans or walnuts…sounds delish. I have been making these for years. The recipe I use calls for Chocolate chips and chopped pecans that are sprinkled on the bottom crust before putting on the caramel. They are awesome. I bet your recipe is good Mary Ann!!! I may have to try your way soon!! They would be great with the addition of nuts Marty!! I had just started another diet! Oh, well… there’s always next month. I expected to have to melt a bag of Kraft® caramel candies to make this. Surprised and happy to see the canned alternative! Thanks, Christy! 🙂 I like the way you think Dale!! These look scrumptious! And I believe they would work fine with my gluten-free flour mix. I need to alter recipes so I can eat them, but this one should do well. YUM! Can’t wait to try it. I hope it turns out well Jean!! Please let me know after you try them!! 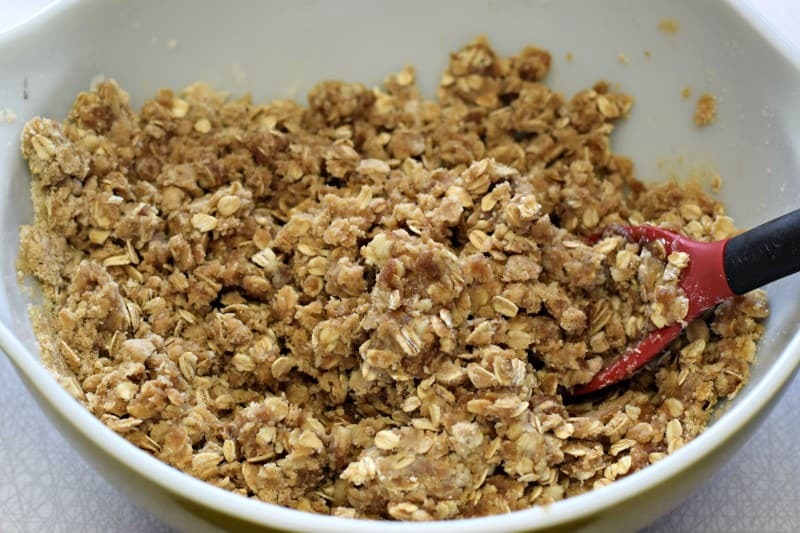 Oh my, these sound so good…..have question, could you also use QUICK COOKING OATS instead of old fashioned ? I have never tried them using quick oats. You can certainly try it, and if you do I would love to know how they turn out!! you never cease to amaze me with your culinary talents. I’m with you about carmels Christy. I love “Bullseyes”-the carmels with the creamy white center. I’m pretty sure I’ll be making these Sunday afternoon after church-even though I have declared that my day off and there is no cooking on my part. I’ll just consider it a treat for me. Thanks for sharing your treasured recipe. Everyone deserves a treat every now and again!! 🙂 It does make it much easier than unwrapping all those caramels!! Christy – I had to laugh out loud a your comment about unwrapping the caramels – I make Rolo brownies – using whatever brownie mix I have on hand – I bake them like the recipe says, but pull them out of the oven about 7 minutes early – then, I put the Rolo candies on them – a bag of Rolo’s will cover a 8×10 pan of brownies, then I pop them in the oven for maybe 5 minutes, pull them out, spread the Rolos over them…..at any rate, once when I was telling a lady how to make them, she asked if you had to UNWRAP the candy before you put them on the brownies!!!!! I laughed….and told her that as long as she wanted to eat tin foil, she could leave them wrapped! By the way, she was totally serious when she asked the question! Love that you posted a Bible verse. Thanks for the Bible verse at the bottom. I really needed to read that verse at this exact moment! I have been troubled by some things going on in my son’s Kindergarten class. To say the least, I am not happy and I’m looking at options other than public school. This recipe looks delicious, and my son always loves helping out in the kitchen–especially with sweet treats! Oh goodness, I will add your situation to my prayer list and I hope that you find the answers that you seek!! 🙂 I hope you can find an excuse soon!! Wow, do these look delicious! Christy, like you, I’ve always been a caramel fan, (it’s my thing, not chocolate). I’ve been meaning to pick up that caramel because we want to try your recipe for the Samoa Brownies, but I still haven’t gotten around to it. This recipe might come first. Although, my mother will probably beat me to it since upon getting your email newsletter today with this recipe, she emailed me, “OMG, OMG, OMG. Look at today’s Carmelita’s! I’m going to gain a lot of weight.” Ha ha, Mom and I both love your recipes, Christy! Thanks!! Oh my goodness, you have just made my day!! I hope you and your mother both enjoy the Caramelitas, I can’t wait to hear your thoughts on them!! OOPS! Sorry Christy I made a boo-boo with my last blogger. However, I just wanted to say Thank You for all of the wonderful Apple Recipes that you posted. 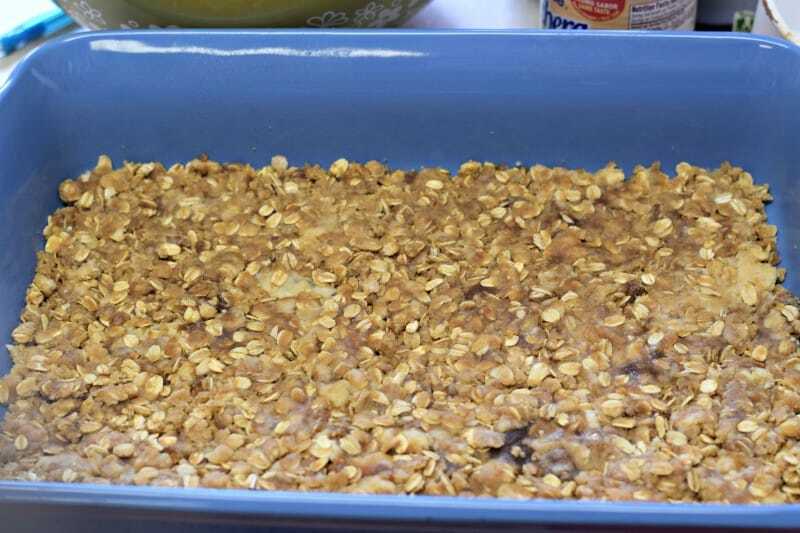 And I am looking forward to try these delicious Quick & Easy Oatmeal Carmelitas, especially for the Holidays when my grand children will visit. Thank So Much, Stay Sweet! Do you suppose you could use the basic recipe and put other kinds of filling? If one wanted chocolate (sorry to be disloyal!! ), would you have a suggested recipe for the filling? Or what do you think about raspberry jam, with or without chocolate chips? or maybe thick rhubarb/strawberry filling? cherry pie filling? 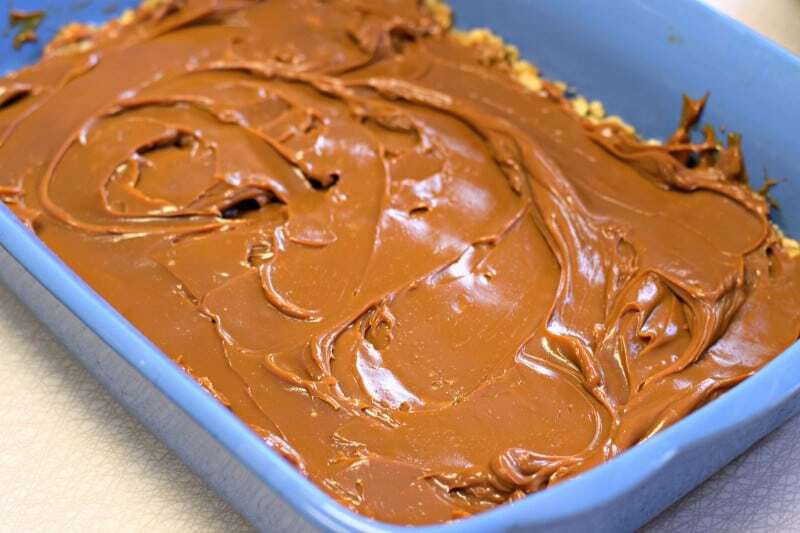 Is the crust/topping mixture flexible when it comes to moisture content for various fillings, do you think? Thanks in advance for advice. BTW, we just love love love your sweet down-home style. If we ever get down your way, we’d love to meet you! I bet you’re a sweet friend! God bless you! Absolutely, go for it! The options are endless and the crust part will really hold up to a lot. Now you’ve got me wanting to play with it more! Thank you for your kindness and grace when thinking of me! Made these yesterday to take to work today! Had to hide them so my husband wouldn’t eat the whole pan! Made the house smell FANTASTIC!!!! They lasted MAYBE 10 minutes at the office!!! Everyone wanted the recipe!!!! SO GOOD ! Definitely the first treat on my Christmas sweets list…would also be PERFECT for a bakesale, I think would be a unique item! Thank you Christy, pinned it, printed it, hand wrote it….LOVED LOVED LOVED these! I am so glad to hear they were a hit Laura!!! $3.38 per can for the caramel was a bit pricey for me. The recipe looks good, though. Maybe for the holidays! You can always make your own caramel as well Renae, it just takes a lot longer. Our local Walmart has Eagle Brand caramel for $1.98. I bought it today and can’t wait to make these for our church supper tomorrow night. 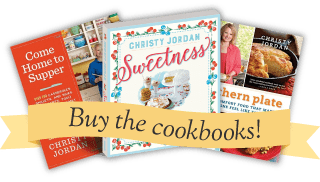 Thanks for all the great recipes Christy!!! I hope you enjoy Teresa!!! I most certainly WILL NOT share this recipe with anyone…as far as anyone else is concerned, I’m going to keep this precious little ditty as my ace-in-the-hole for the answer to everyone else’s brownies and cakes and pies and same old same old (though I adore those, as well). HA! I follow you everywhere I can, I love your easy recipes! Thank you so much Kathy!!!!! I made these for my step-son’s rehearsal dinner last October…they were fantastic!! I made 8 different kinds of cookies (all new, untried recipes) and these were my favorites! I popped the extras in the freezer and shared them again at Christmas, all except the Carmelitas…I hid those to hoard for myself!!! LOL, I have been known to hide and hoard them myself!! I knew that I loved you for more reasons than your great dinner recipes!! I LOVE anything that has caramel in it! I’m like you, I have to limit myself to a few pieces a day if I have a bag of caramels. If I let myself, I could eat a bag of caramels in a couple of days. I have a recipe that is very similar to this. The crust/topping is a little bit different and it calls for chocolate chips & pecans on top of the caramel. I think the name of it is Caramel Candy Bars. It is one of my favorites to make. Thanks for all of the great recipes and inspiration! I love reading your post about your family. I’ve never tried using the caramel in the can, but it would definitely be easier than unwrapping all of the individual pieces. Thank you so much Donna!!!! Was looking for something easy to make for an office potluck and came across this! Love the simplicity (and deliciousness) of these bars! Thanks again for saving the day :).